Beautiful birdcage wrought iron kitchen door handles. Comes with complete mounting hardware. These door handles has our exclusive RS protective finish. Looks beautiful on doors, drawers, cabinets and armoires. Birdcage Pulls, sold individually. 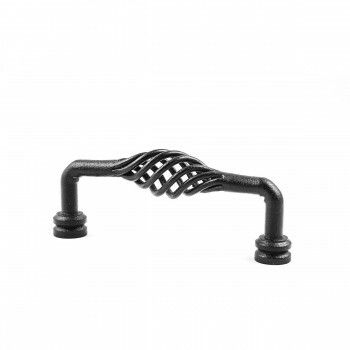 These outstanding Pulls crafted of wrought iron are popular on doors, gates, kitchen pantry doors and oversized kitchen drawers. A fabulous detail for a modern sleek look or for that Old Colonial charm. Affordably update old doors & or a bedroom armoire. Our exclusive RSF coating protects this item for years to come. Mounting hardware included.